The other day I made the most delicious fish pie with dirt cheap salmon heads and other veggies just sitting around my house, and after deboning the salmon heads I had a bunch of bones and skin left, which, instead of throwing out, decided to boil up to make a very healthy fish bone broth, In the past, I'd used that bone broth to make an amazing hot and sour Asian style soup, and I decided to do it again, writing down the details this time so I wouldn't have to figure it out all over again each time. I made mine based on what I had in the house, but it is flexible. If you don't have these exact ingredients, feel free to play around with it, as long as the base ingredients remain the same- the fish stock, ginger, garlic, coconut aminos/soy sauce/fish sauce, vinegar, and pepper. Each addition that I added increases the flavor punch, but you can leave them out if you don't have them, the flavor just won't be exactly the same. A funny story about hot and sour soup, first, before I give you the recipe. When I was pregnant with my oldest, Lee, 9 years ago, I was very nauseous for a very long time. When I had some cravings for foods that appealed to me, I made them, because they were some of the few foods I could keep down. One time, I had a craving for Asian hot and sour soup, so I mixed up a batch to taste... and apparently pregnancy nausea made my taste buds very off, because when I served it to Mike, he said that it tastes like stomach acid, similar to the taste you get in your mouth when you throw up, and begged me to never again serve him "vomit soup". And Mike is definitely not a picky eater, and will eat almost anything. Well, years later, when not pregnant, I decided to make hot and sour soup, and when Mike asked if he could have a bowl, I told him "I don't think you'll like this- you called this "Vomit soup" last time I made it." But at his request, I gave him some to taste, and he really enjoyed it. Moral of the story- go easy on the vinegar, especially if your taste buds are "off" because of something like pregnancy, and add more to your bowl if you want it extra sour. Mike and my kids are now all big fans of hot and sour soup. But in my mind, I still jokingly call it "vomit soup" because that story cracks me up. This recipe is low carb, Paleo, and GAPS legal (provided you use the appropriate options). It's also pretty easy to make. Additional vegetable additions: diced/sliced radishes, diced avocado, bean sprouts, sliced celery, etc. 1. If using fresh mushrooms, saute them in a bit of oil until browned. If using dried mushrooms, skip this step. 2. Dice your carrots or slice them thinly. Add the mushrooms, carrots, ginger, garlic, and seaweed to your fish broth, then boil until the carrots are soft and the mushrooms, if dried, are reconstituted. 3. If you see a lot of water boiled off and you no longer have 5 cups of broth, add more water so you have your 5 cups. 4. Add coconut aminos/fish sauce/soy sauce, salt, vinegar, and black pepper to taste. 5. If using greens, add them now. If you prefer them not fully raw (nettles if fully raw will sting you), cook for about a minute or two to wilt them), otherwise serve right away. 6. Add deboned fish and scallions and optional vegetable additions right before serving. Variations: If you don't have fish or don't eat fish, this recipe also works well with chicken broth in place of the fish broth. 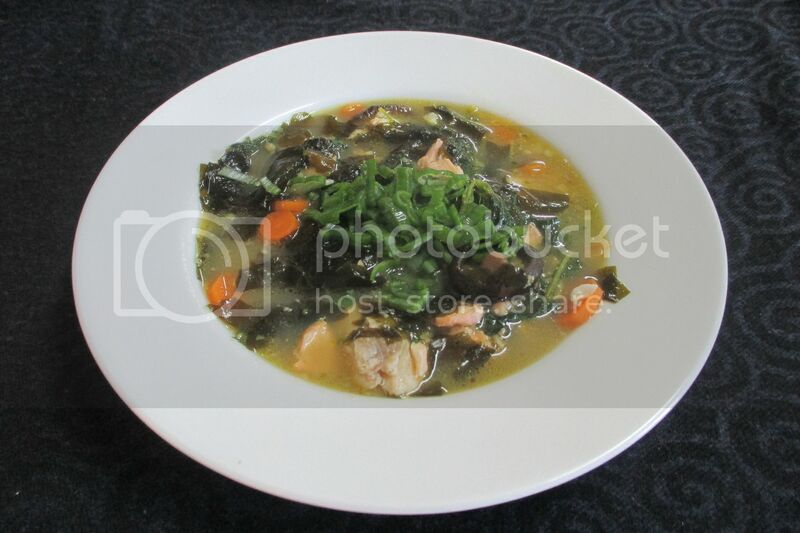 I haven't tried a vegan hot and sour soup, though I've read you can make it with vegetable broth, as long as you increase the mushrooms and seaweed for flavor. Ever have hot and sour soup? How do you make yours? Does this look like a recipe you'd try? What is your favorite thing to make with fish broth? You can also add corn starch mixed with water to slightly thicken it as in a Chinese restaurant. Yes we've always made it vegan, just with water, also tofu is a good add-in. Enjoy!